Chiropractic Blog | ACHES & PAINS - Why regular chiropractic adjustments help. ACHES & PAINS - Why regular chiropractic adjustments help. I would be the first to admit that I can not help everybody get complete relief from their aches and pains. However, even if some pain remains, or some stiffness persists, there is still a huge benefit to getting adjusted on a regular basis. Why?? Firstly, when your spinal joints aren't moving properly, they are being compressed and are more prone to damage and decay. Compression leads to poor nutrition of the disc and nerves so spinal decay, pain and stiffness will accelerate. Ageing, sitting and gravity are major factors here! These three facts of life are fighting 24 hours a day against your desire to be pain free and as active as you want to be. At least put up some kind of fight by getting adjusted once a month! Secondly, your brain depends upon motion messages from your vertebrae in order to signal proper muscle activity to protect your spine and to communicate properly to your stomach, heart, lungs, bowel, bladder, etc. "You have over 37 trillion cells in your body, all controlled by the nervous system. Keep yourself in top shape with regular chiropractic care." 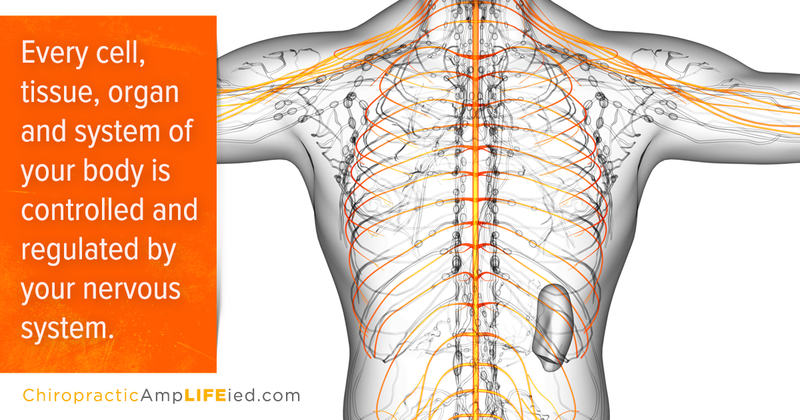 YOUR SPINE IS INTIMATELY CONNECTED TO YOUR NERVOUS SYSTEM. YOUR NERVOUS SYSTEM CONTROLS ALL ACTIVITY IN YOUR BODY. NERVOUS SYSTEM WILL FUNCTION AT ITS OPTIMUM. PAIN DOES NOT HAVE TO LET YOU KNOW THERE IS A PROBLEM BREWING! One of my goals is to help you understand that the mere absence of pain is not an indicator of good health. Let's at least try to keep your spine in optimal shape by checking it regularly and correcting what we can.